On our way up to Banner Elk I hoped to stop by and visit Uncle Spear and Aunt Cheryl who live in Greenville, South Carolina. We ended up needing to wait to stop on the way back because Uncle Spear wouldn’t be there on our way up. I was SO nervous about visiting! For as long as I can remember I have dealt with “tough stuff” by living in a state of denial about it. Uncle Spear was recently diagnosed with ALS. The normal Emily wouldn’t have visited. 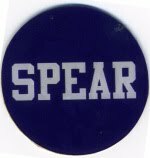 I’d want to think of Uncle Spear how I have always known him: goofy, funny, healthy nut, story-telling, strong, Uncle Spear. I don’t want to think of him as sick. Or as frail. Why would I want to have that image of him? I’d rather just go on with life pretending like he’s fine and not thinking about it. When Nana died I decided to change. I know denying everything isn’t healthy! I have to face reality. I saw Nana after she passed away. I would NEVER do that normally! Not EVER! But I did and it made me face the fact that she’s gone. Uncle Spear is still living! I needed to see him…not just for myself but also for him! On the way to their house I was very nervous. Zach and I talked about it and I knew I needed to be strong and not to cry. It was going to be tough!!! But I needed to visit with him as it’s hard for us to get up there and I’d hate to ever have any regrets. When we got there we saw Aunt Cheryl first and she seemed so upbeat! Their house looked so pretty and ready for Christmas. I went into the living room and planted a smile on my face and let out a big “HEY!” when I saw Uncle Spear sitting in a chair. It was hard. I’m used to Uncle Spear getting up at 5 am and being dressed and ready for the day before I even get out of bed. It was 10 and he was in PJs. He looked much better than I was expecting but you could tell he’s lost weight and seemed more fragile. Our visit was so nice! We caught up on everything that’s been going on. Zach asked for advice about getting some birds to come to our back yard feeder (Uncle Spear is a bird PRO!) and Aunt Cheryl filled us in on the Furman game recently. My uncle was the equipment manager for Furman University for 20 years and had to retire due to the ALS this year. They honored him during their last home game this season! All the players wore this sticker on their helmets and they had him and all his family on the field at half time to present him with a plaque. She said that after the game was over the players came over and picked him up from the stands and carried him to the locker room! I wish so badly we could have been there to see that…how awesome! It was tough talking with them as Uncle Spear is usually the type of guy who will be the center of attention. Instead he would try to speak to us but we could barely understand him. ALS patients are still 100% themselves…the brain isn’t affected…but all the muscles are. So basically his body is slowly shutting down. Right now his entire left side of his body has been affected so he can’t do much with it. His tongue is also affected so he has a difficult time chewing and when he speaks it sounds like his tongue is swollen, you can barely understand anything. He has a little white board that he writes things down on which does help! Even though it was so so difficult to see him struggle to talk, it still made me proud. He has always been a big talker and this junk hasn’t stopped him one bit! We may not have understood over half of what he was saying but it didn’t stop him from saying it. That alone showed me that he’s not going to let this beat him. It may take his body over, but it will NOT hinder his spirit. His nurse came in around 11:00 so we had to go and Aunt Cheryl wanted to go to lunch with us before we hit the road. Zach went to help her get a few things from their shed and I was with Uncle Spear on my own. He motioned for me to come hug him and I did and he squeezed me so tight. I could tell he was starting to cry so I couldn’t help it, I joined right in! I told him that I love him so very much and that I am praying for him everyday and how proud of him I am. I couldn’t understand very well but I could tell that he said he loves me too and is proud too. He motioned for me to give him a kiss and told me that he hopes to be at Brandon’s wedding in March. I so hope they can make it down!!! Lunch with nice with Aunt Cheryl and I’m so thankful that I’ve gotten over my denial phase so I was able to visit with them. It was such a special visit. Yes, it was so tough and yes I spent a good bit crying in the car but it was so worth it!!! I’m hoping to get Kye up there to see them sometime soon and plan to do something to help them out. I don’t just want to to a typical fruit basket or something…I want to think of something that will REALLY help! Any ideas? Previous Post Finally some Skiing! Next Post Goodbye Bottle, Hello Sippy! That made me cry! I love that they honored him at the football game- that is SO awesome!